Definition at line 80 of file lluseroperation.h. Definition at line 95 of file lluseroperation.h. Definition at line 99 of file lluseroperation.cpp. Definition at line 104 of file lluseroperation.cpp. References llendl, llwarns, and mUserOperationList. Definition at line 113 of file lluseroperation.cpp. References LLUserOperation::getTransactionID(), llassert, llendl, llwarns, and mUserOperationList. Definition at line 149 of file lluseroperation.cpp. References LLUserOperation::expire(), LLUserOperation::isExpired(), LLUUID::isNull(), lldebugs, llendl, mLastOperationConsidered, mUserOperationList, NULL, S32, and LLUUID::setNull(). Definition at line 136 of file lluseroperation.cpp. 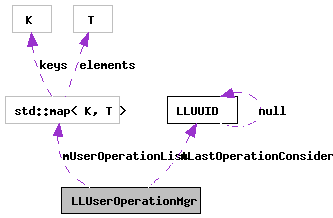 References FALSE, LLUserOperation::getTransactionID(), mUserOperationList, NULL, and TRUE. Definition at line 126 of file lluseroperation.cpp. Definition at line 97 of file lluseroperation.h. Definition at line 96 of file lluseroperation.h. Referenced by addOperation(), deleteExpiredOperations(), deleteOperation(), findOperation(), and ~LLUserOperationMgr().